I am a strong believer in the Green Party. It plays an essential role. Environmentalists cannot afford to patiently wait around for traditional parties to see the light and pass the necessary laws to avert catastrophe. That being said, Canadians have been slow to embrace the Green Party, and that slowness has been magnified by an unfair and unrepresentative electoral system. The Greens’ single-member delegation in the House of Commons — a triumph in its own right — is too small a basket for environmentalists to consolidate all our eggs. And in the face of the slowly unfolding plans of Stephen Harper’s majority government to eviscerate environmental regulations in Canada (the “streamlining” of the assessment process that I’ve written about before was just a start), we need to try something new. Might this strategy result in the appropriation of my beloved Green Party’s values and the stealing of its political thunder? It’s possible — especially if the strategy is successful. But environmentalists’ allegiance is to the planet, not to any party, and at the moment this represents our best path forward. We cannot wait another three years to boot the bastards out. The environment needs parliamentary protection against a short-sighted and power-hungry executive right now. 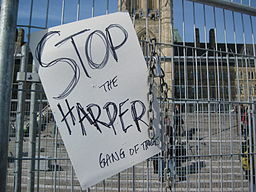 This entry was posted in Canadian Politics, Environment and tagged Conservative Party, Elizabeth May, environmental assessment, Green Party, Stephen Harper by David Taub Bancroft. Bookmark the permalink. Oh, so you’re still reading my blog? I’m glad you approve of my proposal (notwithstanding your implied mockery! ), and yes, I sent the post to Elizabeth May where she may do with it as she pleases. Okay okay, I believe. Thank you kindly.